An elegant and simple method of protecting heat exchangers from the detrimental effects of fouling of the heat transfer surfaces has been developed for systems where one of the heat transfer fluids is routinely consumed or “made-up”, (e.g., district heated potable water or solar heating systems): . 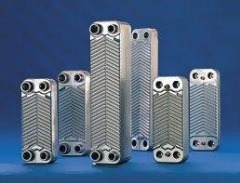 Heat exchanger scaling/fouling is a major concern for both manufacturers and end users from a performance, reliability, and maintenance perspective. Fouling of a heat exchanger occurs when deposits of unwanted materials present in a heat transfer fluid build up on heat exchanger surfaces, limiting heat transfer rates and restricting flow passages. The presence of minerals, corrosion products, or biological growth in the heat transfer fluids are all symptoms that cause fouling. The degree to which fouling impacts performance varies considerably depending on the nature of the fluids being handled and the mechanisms in place to prevent it. Fouling of heat exchangers is most prevalent in systems where one or both of the heat transfer fluids is consumed or routinely “topped up” from a supply that may contain elements that will foul heat exchanger surfaces. An obvious example is a hot water heating system where potable water is consumed for use in a process or for domestic consumption. Such conditions are common in “indirect” freeze protected solar hot water heating systems, domestic hot water heating from district heating systems, or the indirect heating of thermal energy storages by boilers or heat pumps. In these cases, while fluid properties can usually be controlled on the closed primary (heat-source) side of a heat exchanger, significant fouling may occur on the potable water side of the heat exchanger depending on the composition of the water supply. ​While cleaning of certain heat exchangers may be practical in industrial applications, it is often too costly in residential installations or impractical with the current class of compact heat exchanger (e.g., brazed plate heat exchangers). As heat exchangers become increasingly more efficient and compact, fouling may severely limit the life, or performance, of thermal systems. This may limit their applications and diminish their availability as high performance, low cost heat transfer solutions. 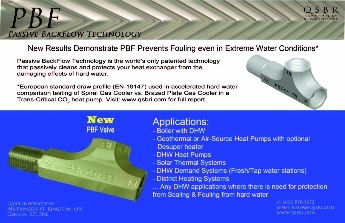 ​Fortunately, in applications where the secondary fluid is consumed (e.g., potable water heating, etc), a simple and reliable solution is available to eliminate fouling. Passive anti-fouling is described below. 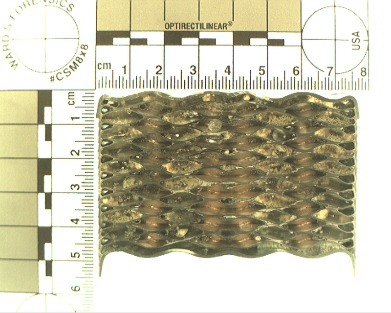 ​​A cross section of a compact brazed plate heat exchanger taken from a residential water heating system after one year of operation. Even after just one year, the flow channels are completely clogged with mineral deposits. To combat fouling in large commercial systems, the chemistry of heat transfer fluids is carefully controlled and routinely checked. If fouling occurs, aggressive mechanical or chemical cleaning operations are used to bring the heat exchanger back to peak performance. 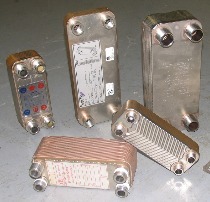 To facilitate cleaning, commercial heat exchangers are often constructed such that they can be routinely disassembled for cleaning as shown (e.g., clamped plate heat exchangers). These operations often involve disassembly of the unit resulting significant “down times” and expense. An alternative arrangement that has been implemented on large industrial heat exchangers is to back flush heat exchangers by reversing the flow direction of the heat transfer fluid at routine intervals. This process “flushes” out deposits accumulated on heat exchanger surfaces. While effective in many cases, it requires automated reversing valves that are expensive and potentially unreliable. In certain cases, if the build up rate of wanted material is slow, system designers will increase the capacity of a heat exchanger to compensate for the reduction in performance, which leads to increased cost and an oversized system. Solar domestic hot water (SDHW) systems are one of the most cost effective ways to utilize solar energy. In climates where there is a potential for freezing conditions, an anti-freeze solution is usually used to transfer heat from a solar collector to a hot water storage through a heat exchanger. Potable water is circulated through the tank-side of the heat exchanger by thermosyphon (i.e., buoyancy induced flow) or by a secondary pump. These types of systems often use low flow rates through the heat exchanger to enhance thermal stratification in the storage tank (see the discussion in the NCHE page), which may be prone to fouling or complete blockage due to the accumulation of sediments, scale and mineral deposits. In addition, there is a high probability that mineral salts and other impurities may be present in the potable water supply in many locations. In these cases, fouling of the heat exchanger may occur if the device is not routinely cleaned or flushed of accumulated matter. (The mechanisms of heat exchanger fouling are described in a separate document attached). While it is common practice in large commercial systems to routinely disassemble and clean components to minimize fouling effects, in residential installations this is not practical due to the associated costs. In these cases, other means must be used to minimize fouling effects. In response to this need, a passive back-flushing system that can be installed on the water supply to the heat exchanger was designed. This device allows the heat exchanger to be routinely back-flushed many times a day. The action becomes a normal operation of the system and does not require user intervention, external power or controls to function. The operation of the Passive Back Flow device (PBF) is displayed below. 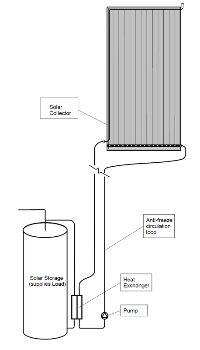 During normal operation (i.e., solar charging), hot fluid from the solar collector heats the potable water in a "side-arm" heat exchanger, causing it to circulate from the bottom of the storage tank to the top. This configuration ensures that the hot water is delivered to the top of the storage were it can be directed to users. During this time, the heat exchanger surfaces on the potable water side are prone to fouling by "inverse soluble salts" that will precipitate on the hot heat exchanger surfaces. 3) the flow through the heat exchanger will often be high sweeping away sediments. 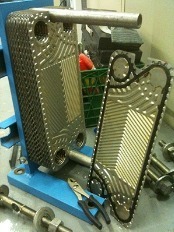 The final result is that the heat exchanger is "serviced and cleaned" every time the home owner consumes hot water. This system ahs been successfully implemented on thousands of residential solar hot water systems in North America. Operation of a Passive Back Flow device (PBF) for a natural convection side-arm plate heat exchanger. This method uses water drawn for household use as the cleaning mechanism. 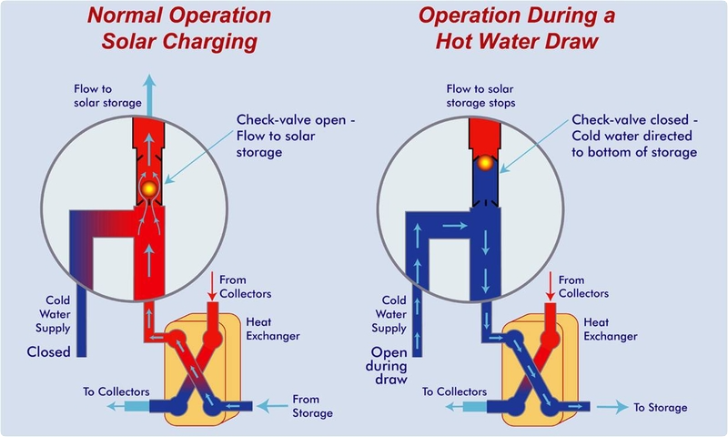 At each draw, cold water from the mains enters the heat exchanger from the top and exits from the bottom, i.e., in the opposite direction to normal solar charging. A check valve that is usually open, located above the cold water supply, closes during the hot water draw, reversing the flow direction through the heat exchanger and back-flushing it with cold water and re-dissolving mineral deposits. When the draw is completed, normal flow through the heat exchanger is rapidly resumed. For more information on the Passive Anti-fouling System, please refer to the following paper published at the annual conference of the International Solar Energy Society: Stephen, J., Harrison, "Passive Heat Exchanger Anti-Fouling for Solar DHW Systems", Proceedings of ISEC, August 6-12, 2005, Orlando, ISEC2005-76232. 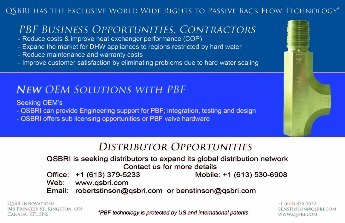 Licensing opportunities, please contact Robert Stinson at QSBR Innovations Inc.